In the Istanbul Museum of Archaeology, carefully-lit, in a room just of the main entrance, with plenty of explanatory boards, is what local people will tell you is the tomb of Alexander the Great. One of the most famous, successful and murderous military leaders in all history, Alexander remains a name to reckon with. Alexander the Great died in 323BC, in Babylon, of unknown causes. He was reputedly taken to Alexandria by his general Ptolemy, as a way to legitimise Ptolemy's claims to have inherited rule of Egypt. The body, however, has been lost, and theories abound as to where the tomb is now. In Istanbul they claim that it is obvious they have it in their Archaeological Museum, and there are certainly good reasons to be impressed by the sarcophagus on show. One long side depicts a warrior, mounted on a horse, with ram's horns on his head. Alexander the Great at the Battle of Issus? This has been interpreted as Alexander fighting at the Battle of Issus (333BC), the horns being a common sign used to mark him out. The other long side is more leisure-based, and shows the supposed Alexander hunting lions. The first short end shows a panther hunt, supposedly by Alexander's comrade Abdalonymus (king of Sidon). The second shows a battle, which has been interpreted as the Battle of Gaza. This was a 'hot' site even then. In Alexander's mere decade of international campaigning he had covered a huge amount of the Middle East, sacking cities, settling new groups, assimilating to local cultures and imposing elements of his Greek heritage on them. A particularly striking feature is the amount of coloured paint which remains on the marble. It is now accepted that the eighteenth-century conception of the Ancient Greek world as a pure, white place is misguided, and that the statues were painted with a variety of natural colours. Where traces of these remain, visible to the naked eye or only under ultra-violet light, it is hard to ascertain precisely what colour they were originally, given the millennia of decay. One has to be impressed, however, at the vibrancy of the colours, even as they remain, and mock-ups will give you a sense of how it might have looked. The sarcophagus was found in Sidon, which is now in modern Lebanon. We know that Tyre and Sidon were places sacked by Alexander, and it is not impossible that his tomb might have ended up here. Dating places is in the fourth century BC, which would be the right kind of time. This sarcophagus is an exquisite example of Greek masonry, demonstrating the immense skill of those who worked on it, even in these 'outposts'. 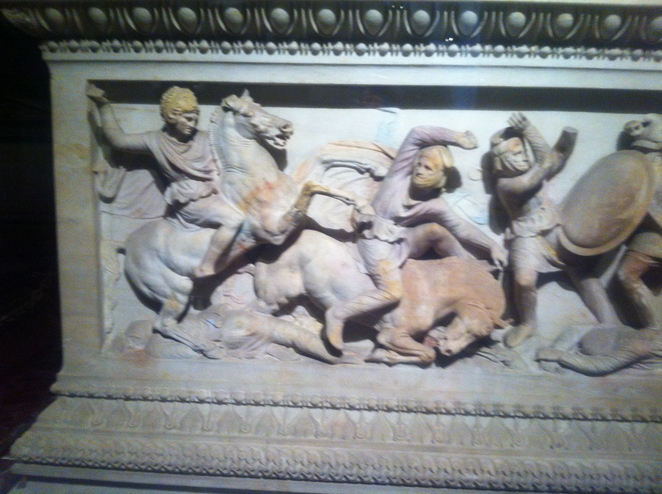 It may be Alexander's tomb, or may be that of someone following in his wake using the iconography attributed to him. Either way it is a magnificent exhibit and it is well-worth stopping off at the museum to see just this. There are many other wonderful exhibits too, and this treasure-trove of a museum should form part of any history enthusiast's tour of Istanbul. Other theories abound, including a 2013 one placing the tomb in Amphipolis, Greece. Admission to the Museum is 10 Turkish Lira, (roughly £3.30) and it is open every day except Mondays. Photographs are permitted. Why? One of the most famous tombs in the world - possibly!